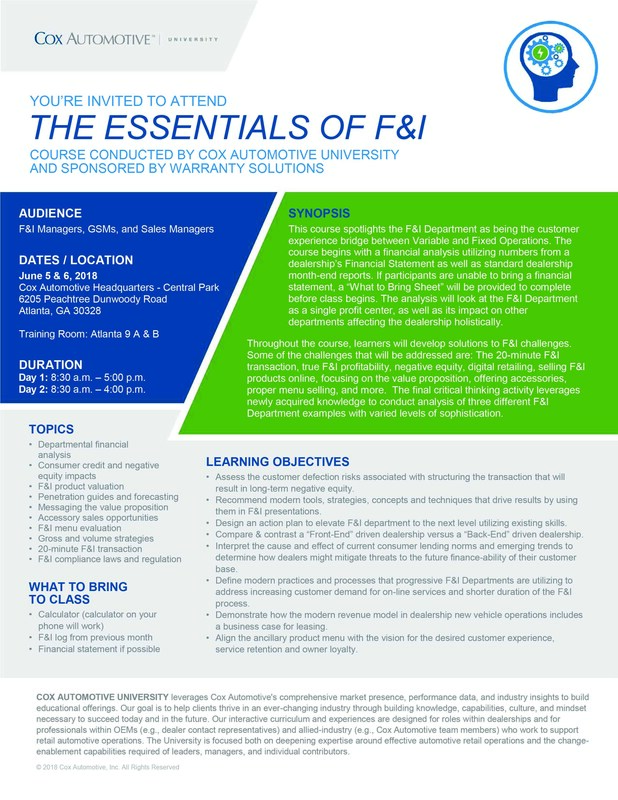 You're invited to attend,THE ESSENTIALS OF F&I Course conducted by Cox Automotive University and sponsored by Warranty Solutions. Day 1: 8:30 a.m. - 5:00 p.m.Day 2: 8:30 a.m. - 4:00 p.m. DURATION Day 1: 8:30 a.m. – 5:00 p.m. Day 2: 8:30 a.m. – 4:00 p.m. This course spotlights the F&I Department as being the customer experience bridge between Variable and Fixed Operations. The course begins with a financial analysis utilizing numbers from a dealership’s Financial Statement as well as standard dealership month-end reports. If participants are unable to bring a financial statement, a “What to Bring Sheet” will be provided to complete before class begins. The analysis will look at the F&I Department as a single profit center, as well as its impact on other departments affecting the dealership holistically. Throughout the course, learners will develop solutions to F&I challenges. Some of the challenges that will be addressed are: The 20-minute F&I transaction, true F&I profitability, negative equity, digital retailing, selling F&I products online, focusing on the value proposition, offering accessories, proper menu selling, and more. The final critical thinking activity leverages newly acquired knowledge to conduct analysis of three different F&I Department examples with varied levels of sophistication. • Assess the customer defection risks associated with structuring the transaction that will result in long-term negative equity. • Recommendmoderntools,strategies,conceptsandtechniquesthatdriveresultsbyusing them in F&I presentations. service retention and owner loyalty. COX AUTOMOTIVE UNIVERSITY leverages Cox Automotive's comprehensive market presence, performance data, and industry insights to build educational offerings. Our goal is to help clients thrive in an ever-changing industry through building knowledge, capabilities, culture, and mindset necessary to succeed today and in the future. 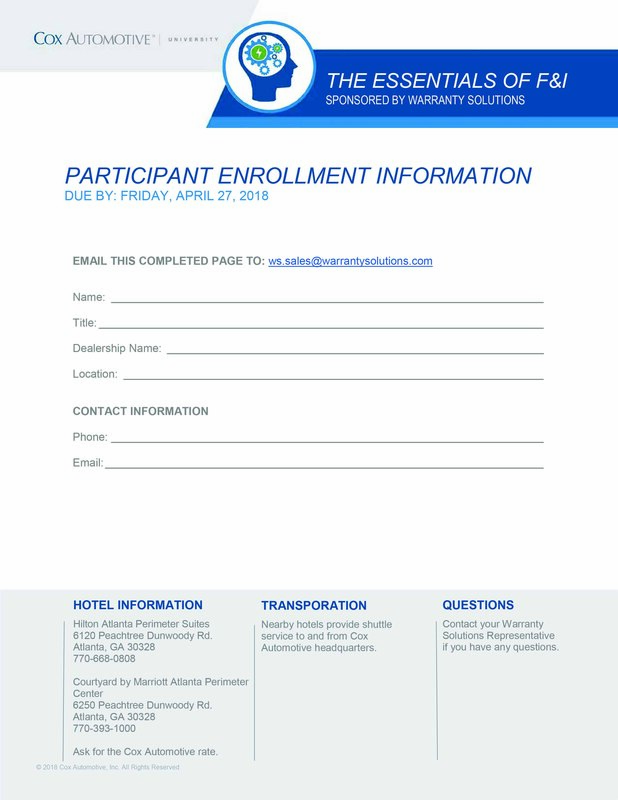 Our interactive curriculum and experiences are designed for roles within dealerships and for professionals within OEMs (e.g., dealer contact representatives) and allied-industry (e.g., Cox Automotive team members) who work to support retail automotive operations. The University is focused both on deepening expertise around effective automotive retail operations and the change- enablement capabilities required of leaders, managers, and individual contributors.